As the world awoke to news of the deadliest mass shooting in U.S. history, a team of confort dogs from Iowa were already on a plane to Orlando. Their mission: to help those grieving after 29-year-old Omar Mateen opened fire at a gay nightclub, killing 49 people and injuring 53 others. Five-year-old Gracie, a golden retriever, is part of a group of 12 comfort dogs deployed to help survivors, first responders and others affected by the attack. 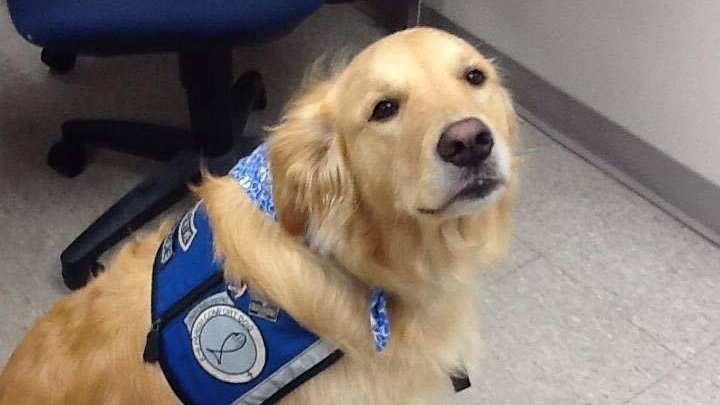 Gracie is part of Davenport’s Lutheran Church Charity K9 Comfort Dogs, an organization committed to training dogs to help people cope with traumatic events. She and other dogs, Marsh-Johnson said, were invited to Orlando by a local branch of the Lutheran Church. “(The church) has invited the community to come in and meet and greet with the dogs,” she said. The dogs, she added, have been attending vigils for those killed during the Pulse nightclub massacre, met first responders, and have been to the city’s counselling centre. Comfort dogs are different from regular therapy dogs because they are trained specifically to provide a sense of compassion. Gracie knows 25 different commands, including lying down on her side to encourage those grieving to rest their heads on her. “Many are in a lot of grief of that and (Gracie) absorbs that very well,” Marsh-Johnson said.